The types of kitchen flooring available on the market today are almost overwhelming. And the information about which kitchen flooring options are best or should be avoided only confuses the situation. The best family-friendly kitchen flooring is the one that fits your lifestyle best; low-maintenance flooring for those with active lifestyles, and high-maintenance for quieter lifestyles. To find kitchen flooring ideas that get your creative juices flowing, research the kitchen flooring option that works for you at flooring stores and home improvement stores. You’ll love seeing the best kinds of kitchen flooring available. What you find will range from checkerboard flooring (in a kitchen that can be wow!) to stone to wood to tile. Are you going to fall in love with the kitchen black and white flooring or a more subdued tan stone? What kinds of kitchen flooring do you have in mind? There are so many different types of kitchen flooring available that it may seem very overwhelming when you try to choose just one kind. It is good that there are so many options, but how do you know which kitchen flooring option is right for your kitchen and your home? Before you run out to your home improvement store to buy kitchen flooring, first evaluate your kitchen and its use. What style is your kitchen? Is it an area that is walked in and out of frequently? Is it open to an entrance or exit? What is the flooring going to feel like when you are standing on it? Research all of your kitchen flooring ideas to help you narrow down your search. 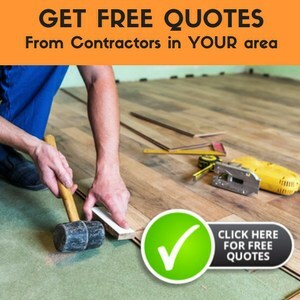 Then when you go to the home improvement or flooring store, you can concentrate on just a few different choices rather than every kind of flooring that they have. Make sure that you step on each of the choices before making your decision so you will know what they feel like under your feet. If you want cushiony options and the area is not a high traffic area, then you will most likely want to try out vinyl, linoleum, or carpet for your kitchen floors. Vinyl and linoleum are very easy to clean and take care of and come in many different patterns and colors that can be mixed and matched to create a floor that you will love. Carpet is also another option, especially if you value comfort over ease of maintenance. If you have children and pets that run through your kitchen constantly, then you will want flooring that is durable and easy to care for. This includes vinyl, linoleum, laminate, and polyurethane coated hardwood flooring. The choices that are available in these four floorings range in different finishes, woods, and patterns to create a beautiful kitchen that you will love being in. If you want to add a little cushy to the floors, consider adding washable throw rugs in the places where you frequently stand to make it more comfortable. Whichever flooring you choose, make sure that it is easy to wipe up spills and messes so that you will have a beautiful floor for a long time. You will be much happier with kitchen flooring that you do not have to stress over rather than flooring that you have to worry over when a spill is made. Choose flooring based on the use of your room, rather than completely on the look. With any luck, you will be able to merge the two to create a kitchen floor that you will love! From checkerboard flooring in your kitchen to painted kitchen flooring, to stone, wood, or any other kind of kitchen flooring, remember that the best family-friendly kitchen flooring option is the one that works for you and your family. Choose flooring that makes your proud of your kitchen and helps you to enjoy it more. Then you will have made a kitchen flooring choice that you will be satisfied with for many years! Certified designers of kitchen may give you elaborated designs but the basic function of the flooring is provided by the ceramic tiles. It can be a good alternative over the porcelain or Italian forms. These are the basic ones with no budgetary constraints. They provide you with varied of options with good styles and patterns. The modern kitchen has been optimized with contemporary designs and classic prints. They come in every shape and good colors. You can look out for its pros and cons and decide accordingly. These tiles can give a pleasant look for the kitchen with varied of options. The main factor for which people prefer ceramics is the ease of maintenance. Yes you read it right. It can be dealt easily for all the spills and toughness of your kids mess. It can’t stand for longer period. You may notice cracks and slits in the tiles when things are broken on the floor. Timely replacements should be done. Stains and patches may retain when proper cleaning is done. They are not water absorbents tiles. Hence, slippery tiles can be a pain.